Abu Dhabi Investment Fund buying 3 Editions from Marriott. What does this mean to Marriott and the Edition brand? Hotel Lawyer on the reported sale by Marriott of 3 Edition hotels. The story, in which I am quoted, describes reports from people close to the deal, that Marriott International is about to close a sale of 3 Edition hotels in London, New York and Miami Beach. The reported buyer is Abu Dhabi Investment Authority, or ADIA. So what does this transaction mean? The hotel lawyers of JMBM’s Global Hospitality Group® frequently attend hospitality industry conferences to stay current on critical issues affecting hotel owners, investors and lenders. 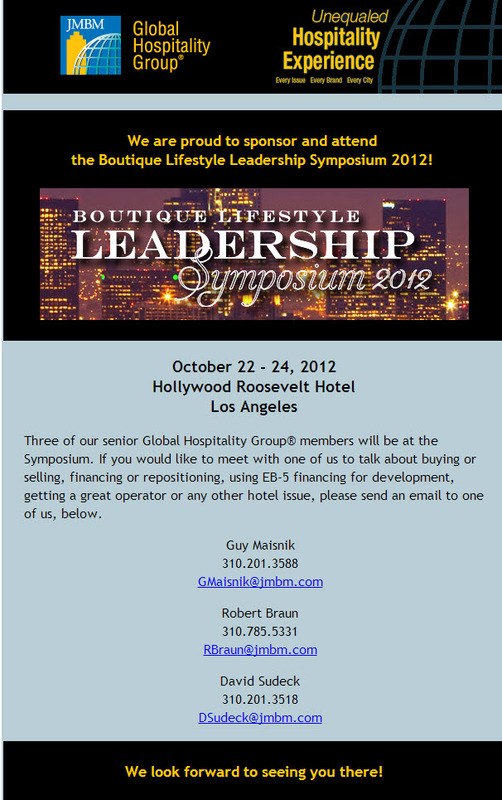 My colleagues, Guy Maisnik, Bob Braun and David Sudeck will attend the Boutique Lifestyle Leadership Symposium in Los Angeles next week. Hotel Lawyer on eco-friendly hotel financing in Hollywood California. Today, JMBM issued a press release announcing that its Global Hospitality Group® closed the senior debt portion of the capital stack on one of the largest single hotel mixed-use projects in the country — and one bound to be a “Green” project at that! The complex construction loan transaction was for JMBM client, HSH Nordbank AG, a leading credit institution headquartered in Hamburg, Germany, and particularly renowned for very large construction loans on luxury hotel projects. This is a significant transaction for several reasons. Hotel Lawyer: Get on your feet! Lifestyle and mixed-use resorts getting a boost from Latin pop stars Gloria and Emilio Estefan with a new development in Vero Beach, Florida. Hotel Lawyer in Florida. While Gloria Estefan’s fans are anticipating the September 2007 release of her new Spanish-language album, 90 Millas, featuring original music inspired by her native Cuba — the hotel industry is eagerly awaiting the opening of her new luxury resort, Costa d’Este in Vero Beach, Florida. Gloria and Emilio Estefan are not new to the hospitality industry — they currently own 5 Cuban restaurants in Florida and Mexico, and the Cardozo Hotel in Miami. Their new mixed-use resort will include 94 hotel rooms, meeting space, a restaurant and spa. The resort is scheduled to open in January 2008, according to Benchmark Hospitality International, which will manage the property. Breaking news for “lifestyle” hotels. The Ian Schrager and Bill Marriott “marriage” — Will it lead to eternal bliss or end in divorce? Hotel Lawyer on the Schrager-Marriott marriage and its impact on lifestyle hotels. One of my steady themes here at www.HotelLawBlog.com, is that lifestyle hotels are the hottest thing going in new hotel development, particularly hotel mixed-use. (See, for example, “The new “LIFESTYLE” hotel brands are changing the hotel industry and hotel mixed-use.“) But at a press conference held on the roof of Schrager’s Gramercy Park Hotel in Manhattan at 10:00 am on June 14, 2007, Bill Marriott (chairman and CEO of Marriott International) and Ian Schrager (the founder of Ian Schrager Hotels, now known as “Morgans Hotels”) surprised most of the hotel industry with their news. Marriott (age 75) and Schrager (now 60) announced formal plans to partner in the creation of a new lifestyle boutique hotel brand. The as-yet-unnamed-brand will provide the high-design, boutique, lifestyle product that Schrager invented, with Marriott’s world-class hotel operating resources and development support. For several years, industry experts have wondered how Marriott International could surrender leadership in the lifestyle boutique area to Starwood’s W brand, which some call a knockoff of Schrager’s original concept. Only half in jest, some predicted that Marriott would spawn a similarly hip “M” brand (which looks a lot like a “W” turned over). If Marriott is to reclaim its share of this exploding lifestyle segment, it clearly needed to move quickly to make up for lost time. But many think the marriage of Ian Schrager and Bill Marriott is doomed to an early divorce, if it even makes it to the conjugal bed. Doubtful pundits cite fundamental incompatibilities of style and approach. Meanwhile, Schrager and Marriott are projecting that at least five firm development deals will be signed for the new brand before 2008, and are looking for more than 100 hotels to be open within a decade. Hotel Lawyer: The new “LIFESTYLE” hotel brands are changing the hotel industry and hotel mixed-use. Miraval: The health and wellness lifestyle brand. Hospitality Lawyer on “LIFESTYLE” hotel mixed-use development. Are Valencia and Miraval the new paradigms for “lifestyle” hotel mixed-use? Hotel Lawyer Live from The Hotel Developers Conference ™ in Rancho Mirage. Veteran hotel developers, speaking at The Hotel Development Boot Camp – the pre-conference session of JMBM’s Hotel Developers Conference™ — recall the days when the hotel component of a mixed-use development was the “blood donor” of the project. Now, hotels are reaping profits in mixed-use environments and are viewed as essential components for infusing excitement into a mixed-use project. Indeed, mixed-use developers are wooing hotel developers in hopes of striking deals that will provide them with the means for providing a community hub for their projects. Yesterday, I said that hotel mixed-use developers should pay attention to two breaking news items. One was Barry Sternlicht’s “1” Hotel and Residences. The other is Hilton’s plans announced October 18, 2006 to add Waldorf=Astoria branded Residences to the top of the Conrad Hotel Las Vegas. Both of these announcements emphasize the importance of brands in the hotel industry and creation of two high end brands by industry power houses in two very different ways. Sternlicht is creating a fresh, new eco-friendly brand from scratch. Hilton is seeking to build its brand from the base of an internationally recognized icon. But beyond all that, why is this significant? Hotel mixed use developers should pay attention to two lead items today which I noticed in Hotel-Online and Hotel Business. Barry Sternlicht’s Starwood Capital has announced 5 new hotel mixed-use developments — launching a new hotel brand called “1” Hotel and Residences. At the same time, Hilton announced the Waldorf=Astoria branded Residences for its big hotel mixed-use project in Las Vegas. What are these developments about and what potential significance do they have?